Wine Predator Wins Wine Blogger Scholarship! 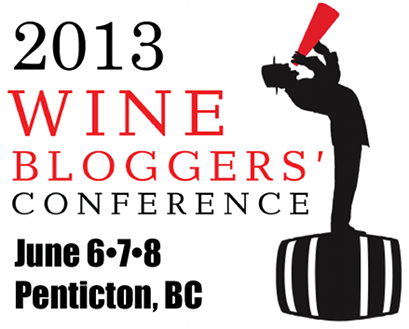 I’m very excited to announce that I was chosen by the Wine Bloggers Scholarship Committee to attend the 2013 Wine Bloggers Conference in Penticton, British Columbia! This will be my sixth Wine Bloggers Conference: I’ve been to three states so far–California in 2008 and 2009, Walla Walla WA in 2010, and Portland in 2012 and soon to be three countries–US, Portugal (as a guest of Enoforum Wines in 2009), plus Canada in 2013! Thank you to all the wonderful donors who made my scholarship possible! Especially Tom Wark of Fermentation who matched $500 of the donations and Amy Anderson Gross the Vine Sleuth who matched his match plus $1! The committee would love to bring at least two more of the wait listed bloggers to Penticton–won’t you please send in your tax deductible donation? Thea Dwelle – Scholarship Chair / Ambassador of Luscious Lushes. And thanks to the efforts of the 2012 committee too! About 250 people are expected to make the trek to Penticton June 6 with up to 100 take a bus from Seattle with an overnight to sample the wines in the Lake Chelan region midway. That’s the route I’m planing on taking which will allow me to do some poetry gigs in Seattle the weekend before and hopefully spend some time at wineries in Woodinville where I tasted wines from many wineries in 2010 but we only had time to visit Chateau Ste Michelle. In some ways, I’m grateful the conference will be closer in size to the early days because it’s more intimate that way and it will give me a better chance to get to know more of the new bloggers and be easier to see my friends in the crowds! I can tell you, though, that as an adventure travel organizer I would place Penticton near the very top of beautiful wine areas not only in North America but in the world. The setting is superb, with Penticton situated on the shores of two lakes, mountains all around, and vineyards on the bench above town. I was extremely impressed with BC wines and we have barrels of wine in store for attendees, with some great excursions into wine country. It’s really going to be an incredible event and if you’re a blogger, you should make an effort to join us. The folks who attend WBC are lots of fun, smart, and knowledgeable; I learn so much from my fellow bloggers about wine, blogging, and life that I can’t experience anywhere else. I’m excited about reporting about WBC 13 here so please subscribe! Get me in your inbox so you don’t miss out on my adventures! The Wine Blogger’s Conference in Penticton, British Columbia, Canada will be great! Lots of adventures await! Please subscribe so you don’t miss out! Congratulations! I’m not surprised! I really enjoy your blog. Thank you so much, Grace! I really enjoy your poetry! Thank you!! Will I see you there? No, unfortunately not. The location is a bit too far and remote for me (I live in Connecticut). May be next year….